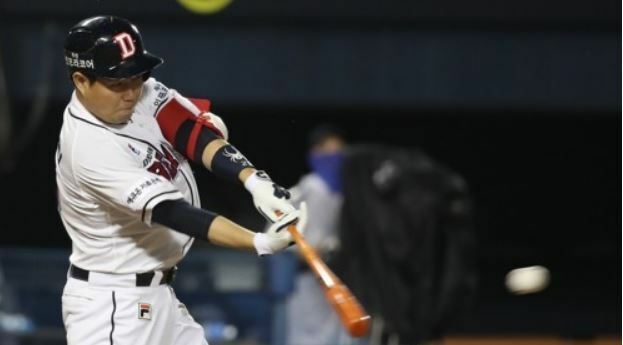 A veteran catcher currently leading the league in batting average has emerged as the top vote-getter for the Korea Baseball Organization All-Star Game. The KBO announced the starting lineups for the Dream and Nanum Teams for the annual midseason affair to take place on July 14 at Munsu Baseball Stadium in Ulsan, 400 kilometers southeast of Seoul. Doosan Bears' catcher Yang Eui-ji, representing the Dream side, led all starters with 484,185 votes from fans and 213 more from players, coaches and managers. Yang earned 58.42 All-Star points. Fans accounted for 70 percent of the vote, while fellow players, coaches and managers were responsible for 30 percent of the vote to determine the starters. Yang, considered the KBO's best two-way catcher, is tops with a .378 batting average. He also has 17 home runs, just five shy of a career high set in 2016, with the Bears sitting pretty in first place at 53-26, 5.5 games ahead of the Hanwha Eagles. The Dream Team will also be made up of players from the Lotte Giants, SK Wyverns, Samsung Lions and KT Wiz. The Nanum Team will feature players from the Kia Tigers, NC Dinos, LG Twins, Nexen Heroes and Hanwha Eagles. Yang is one of nine Doosan starters on the Dream Team. He's joined by starter Josh Lindblom, middle reliever Park Chi-guk, closer Ham Deok-ju, second baseman Oh Jae-won, shortstop Kim Jae-ho, outfielders Kim Jae-hwan and Park Kun-woo and designated hitter Choi Joo-hwan. Other Dream Team starters are Giants first baseman Lee Dae-ho, Wyverns third baseman Choi Jeong and Giants outfielder Son A-seop. Lee Dae-ho, one-time Seattle Mariners first baseman, is a two-time All-Star Game MVP and will play in his ninth All-Star Game. Choi Jeong was the 2017 MVP. The Nanum Team has six starters from the Twins and four more from the Eagles. The four Twins players are starter Henry Sosa, catcher Yoo Kang-nam, shortstop Oh Ji-hwan, outfielders Kim Hyun-soo and Lee Hyung-jong and designated hitter Park Yong-taik. The four Eagles are: middle reliever Seo Kyun, closer Jung Woo-ram, third baseman Song Kwang-min and outfielder Jared Hoying. Other Nanum starters are Heroes first baseman Park Byung-ho, the 2014 All-Star Game MVP, and Tigers second baseman An Chi-hong. Overall, 11 of the 24 players are first-time starters, and seven of them will be going to their first All-Star Game. Doosan manager Kim Tae-hyung will be the skipper for the Dream Team, and Kia boss Kim Ki-tai will handle the Nanum Team. Their managerial selections -- 12 a side -- will be announced on Thursday.